Users of social networks launched flash-mobs to boycott the World Cup, which is to be held in Russia. People publish collages in different social networks with calls not to go to the World Cup in Russia. Collages show war crimes of the Russian Federation. 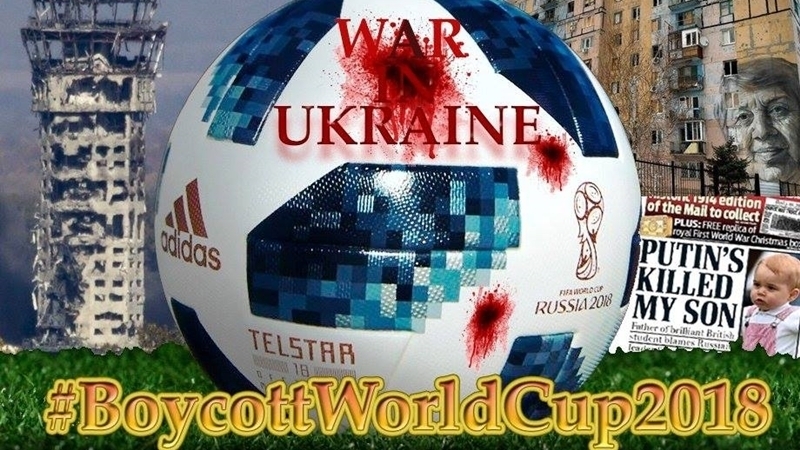 Users publish them under the following tags: #NoWorldCupForRussia, #FIFAWorldCup2018, #FIFAWC2018, #Russia2018Boycott, #Boycott_Russia2018. Earlier, the Ukrainian political prisoner of the Kremlin Mykola Karpyuk on his birthday - May 21 urged fans not to go to the World Cup in Russia. The Kremlin-controlled Ministry of Tourism of Crimea stated it expects an increase in tourist flow in May-June this year in connection with the 2018 FIFA World Cup, which is to be held in Russia. According to Deputy Minister of Resorts and Tourism of Crimea Lyudmila Babiy, tourists who visit the annexed peninsula, will be football fans from the nearest locations of the championship.